This low-cholesterol recipe is ready to become a family-favorite. Eggplant, the base of this dish, contains nutrients like potassium, vitamin K, folate, fiber, and copper. Plus, it's only 33 calories per serving! Bulgur, a commonly used grain in Middle Eastern cooking, is used in tabbouleh salad, and goes perfectly with this colorful, simple-to-make dish. With only 300 calories, this healthy dinner is a great way to stay full and satisfied without compromising flavor. Make it vegetarian by using vegetable stock instead of chicken stock. 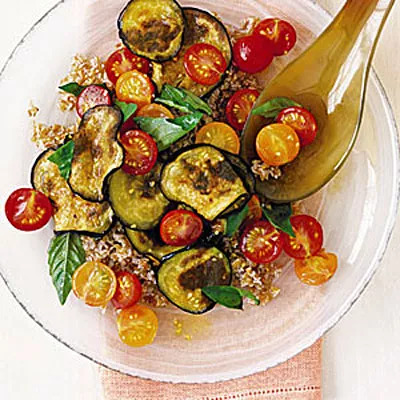 Ingredients: Bulgur wheat, eggplant, extra-virgin olive oil, cherry tomatoes, red wine vinegar, salt, pepper, fresh basil, onion, red and yellow bell peppers, turmeric, garlic, ginger, fat-free less-sodium chicken broth, parsley, lemon juice.